Every Sunday during the summer months of June through September, Chapel is held in the Clubhouse ballroom. The Rev. Richard Anderson conducts the service. It is a nondenominational service open to the entire community. Service begins at 9:00 a.m., and lasts for one hour. Casual dress is acceptable and many members show up in golf clothes in preparation for their round of golf immediately after the service. Prior to the service, seating is brought into the ballroom Chapel and the Alter is placed facing the seating. Hymnals, donated by David and Betty Rush are placed on each chair. Someone in attendance usually brings a lovely vase of flowers. The piano is moved near the seating. The service opens with announcements and a hymn. Reverend Anderson then delivers a wonderful sermon. Another hymn, collection of offerings, Apostle’s Creed, and The Lord’s Prayer continue as part of the service. At the end, everyone joins in singing “Go Now in Peace”, and we are out the door, uplifted and sent on our way to do good. In the early days, there were many young families associated with High Meadows. The leaders felt the need for a religious organization or bible study for their young children. Thus, they organized a Sunday School. The classes were held at the swimming pool shelter. Some of the leaders were Sarah Long, Dot Alexander, Jane Garrison and Susanne Mellow Irwin. Suzanne was the teacher. The Charter is registered with the State of North Carolina and the Register of Deeds in Sparta, North Carolina. In the early ’70s, a group got together to consider building the Chapel for worship. Red Davis provided land located at 201-203 Country Club Drive. The Chapel was to include housing. Pledges were made for the Chapel however those pledges did not come near the cost of building the structure. Meanwhile, around 1974, the country club realized the need for expansion of the clubhouse. A committee consisting of Carter Holbrook, Richard Johnson, Curtis Long, Don Alexander, Jim Massey and Mary Pfeiffer approached the Chapel fund raisers. The committee proposed, “If” “the Chapel folks would donate the pledges to the addition of the clubhouse, they would, in turn provide a designated space for worship gathering within the clubhouse. The new addition was to be used for “religious and other club functions”. The money which was intended to build a separate Chapel on Country Club Drive was transferred, instead to the clubhouse expansion project, an amount that totaled around $10,000. 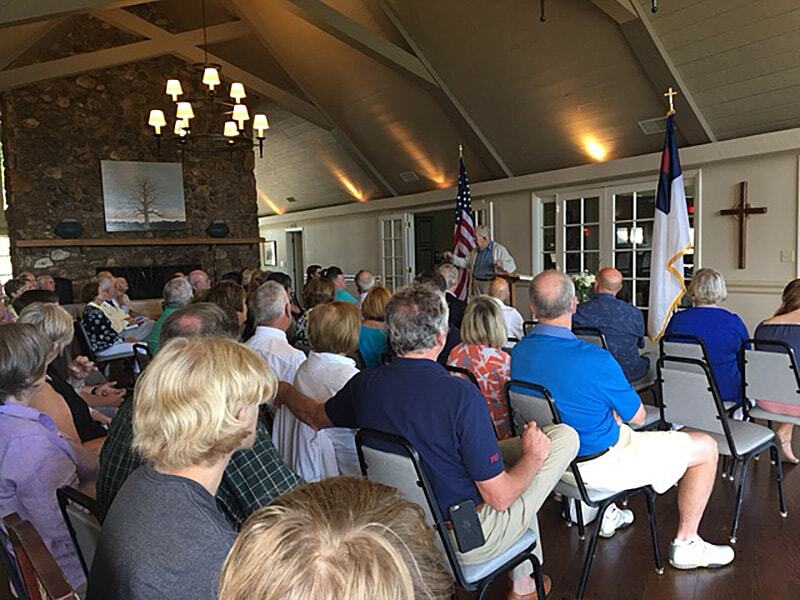 High Meadows Golf and Country Club promised use of the clubhouse for Chapel services to be held in perpetuity. Rev. Don Mimbs: Don was formally Pastor of The Presbyterian Church in Sparta, North Carolina. He served High Meadows Chapel from 1975 to 1984. Rev. Glenn Graves: Glenn was the Pastor at the First Baptist Church in Sparta, NC. He served High Meadows Chapel from 1985 –1987. He left to enter the Mission Field and served several years in the Dominican Republic. He then moved to serve in a church in Virginia. Dr. James Taylor Frazier: Jim served as Pastor of the High Meadows Chapel from 1988-2016. He and his wife, Peggy came to Alleghany County in 1983 after serving as Pastor at several churches in North and South Carolina. He initially came here as Chaplain of the Glade Valley School until its closing in 1985. He served as Pastor of Sparta Presbyterian Church from 1985 until his retirement. He and Peggy have two children, Lora and John (deceased). Jim is a graduate of Center College of Kentucky, and Columbia Theology Seminary in Decatur, Georgia. He earned his Doctorate from Union Theological Seminary in Richmond, Virginia. He and Peggy reside on a farm in Glade Valley, NC. Richard grew up in Belvidere, Illinois and made quite a name for himself as a singer and athlete. He was a frequent bass soloist at the Presbyterian Church there, where he became the senior pastor in the 1980s. While in high school, Mr. Anderson was the only senior to “start” on the school’s football, basketball, and baseball teams. Mr. Anderson was accepted by Harvard, Yale, and Princeton for his ministerial studies, but chose Yale for its great singing tradition. While attending Yale, he was the only singer who was accepted as both a soloist for the Yale Glee Club and the Yale Russian Chorus. In Yale’s 370-year history Richard became the first person to graduate with simultaneous degrees from the divinity and music schools, leading to positions of a minister of Word and Sacrament and as a bass-baritone opera singer. Rev. Richard Anderson is married to Robin Anderson from Sea Cliff, New York. They are a blended family and the proud parents of five grown children and two granddaughters. Robin will tell you that her job is to keep Richard “humble.” Mr. Anderson is an avid golfer and absolutely loves our High Meadows golf course! Ellen Church: Ellen has inspired us with her music for many years. She was from Sparta, NC, and was a member of the First Baptist Church. Deb Oliver: currently plays beautiful Chapel music for our service. Deb grew up in the Corning area of upstate New York, where she received private piano instruction and choral music training throughout her school years. She first played the piano at age 13 in a little mission church where services were held in an old one-room schoolhouse. Her extended family is still located in New York. Over the years she sang in the Corning Philharmonic Chorus, the Charlotte Choral Society, and has played the piano and directed music at various churches over a period of more than four decades. This is her fifth summer at High Meadows Chapel. She has lived in Alleghany County since 1990 and has two sons, presently in Boone. She and her husband, Bill operate a vacation rental home just off the Parkway on Vestal Rd, which keeps them busy. They enjoy traveling and hiking, and feel blessed to live in the mountains, where she said she never tires of the views! The beautiful Yamaha grand piano was generously donated by Pete and Helen Williams. Many thanks to Harold Shehan, Deb Oliver, Suzanne Mellow Irwin and Rev. Richard Anderson for providing information for this article.